Cubism art, an avant-garde movement whose influence surfaced during the 1910s-1920s, is often considered the most influential artistic movement of that century. Pioneered by Spanish artist Pablo Picasso, the Cubism art movement also saw other notable contributors such as Juan Gris, Georges Braque, Fernand Léger, Robert Delaunay and Jacques Villon. 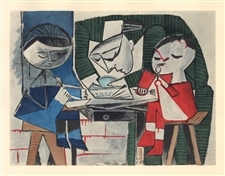 Many Picasso Cubism paintings are instantly recognized as his, even by art novices. While Picasso is generally credited with inventing Cubism, these other artists each contributed their own unique influences to the movement. 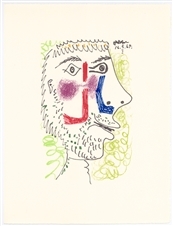 We offer approximately 150 fine cubism prints and cubism lithographs from the most well-known cubist artists, including all those listed above. 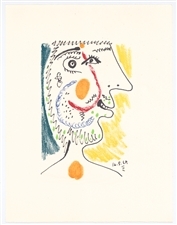 You'll also find a selection of pieces in pochoir (after the oil painting), lithograph (after the water color), original etchings, linoleum cuts and more. Medium: pochoir (after the 1953 painting). This lovely print enhanced with pochoir hand coloring is from the rare and much sought-after "Venti Pochoirs Originali" portfolio, published in Milan in 1955 by Silvana Editoriale d'Arte in an edition of 200. The image size is 8 1/4 x 11 inches (208 x 280 mm) and the full sheet measures 11 3/4 x 15 1/2 inches (297 x 395 mm). Not signed. Medium: original woodcut. Catalogue reference: Prasse 301. This impression was printed in Germany in 1920 as the frontispiece for Das Kunstblatt, published during the height of the German Expressionist movement. 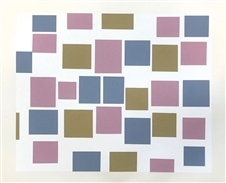 Printed on wove paper, the image measures 6 3/4 x 7 7/8 inches (173 x 200mm); the total sheet measures 8 x 10 3/4 inches (200 x 275mm). Not signed. Condition: there are a few small tears (repaired) at the edge of the sheet -- away from and not affecting the image -- and minor foxing. Medium: pochoir (after the 1920 painting). This lovely print enhanced with pochoir hand coloring is from the rare and much sought-after "Venti Pochoirs Originali" portfolio, published in Milan in 1955 by Silvana Editoriale d'Arte in an edition of 200. The image size is 10 3/4 x 8 inches (274 x 200 mm) and the full sheet measures 15 1/2 x 11 3/4 inches (395 x 297 mm). Not signed. Medium: pochoir (after the 1939 painting). This lovely print enhanced with pochoir hand coloring is from the rare and much sought-after "Venti Pochoirs Originali" portfolio, published in Milan in 1955 by Silvana Editoriale d'Arte in an edition of 200. The image size is 11 x 8 1/4 inches (277 x 208 mm) and the full sheet measures 15 1/2 x 11 3/4 inches (395 x 297 mm). Not signed. 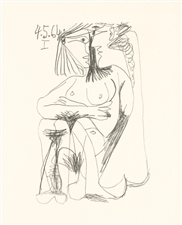 Medium: original lithograph. This magnificent lithograph in Leger's signature cubist / modernist style was printed in 1949 for Derriere le Miroir issue no. 20-21 "L'art abstrait" published in Paris by the Maeght atelier. The total sheet (including margins) measures 15 x 21 3/4 inches (378 x 555 mm). Issued as a folded sheet with a center crease and text on verso. Not signed. Medium: pochoir (after the oil). Published in Paris in 1929 by Charles Moreau in a limited edition for L'Art Cubiste. This is a nice impression printed by pochoir master Daniel Jacomet; it is presumed that no more than 1000 impressions were printed and this edition is now rare. Image size: 5 3/4 x 8 1/8 inches (146 x 205 mm); the artist's name is printed in text beneath the image. Signed in the plate (not by hand). Medium: original linoleum cut. This linocut by Italian Futurist Gino Severini is a much sought-after piece from the rare XXe Siecle (issue No. 5-6). Published in Paris by San Lazzaro in 1939. Sheet size 12 1/2 x 9 3/4 inches (320 x 245 mm). Signed in the plate (not by hand). Medium: pochoir (after the watercolor). Published in Paris in 1929 by Charles Moreau in a limited edition for L'Art Cubiste. This is a nice impression printed by pochoir master Daniel Jacomet; it is presumed that no more than 1000 impressions were printed and this edition is now rare. 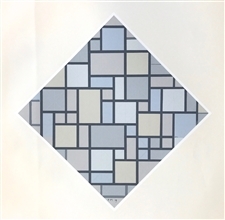 Image size: 7 3/4 x 6 inches (195 x 152 mm); the artist's name is printed in text beneath the image. Signed in the plate (not by hand). Condition: there is a small tear to the top edge of the sheet, not affecting the image. Fernand Leger lithograph "La partie de campagne"
Medium: lithograph (after the watercolor). Printed for Derriere le Miroir (issue no. 121-122) in 1960, and published in Paris by the Maeght atelier. Sheet size: 15 x 22 inches (380 x 560 mm). There is a center fold and other images on the back side, as issued. Signed in the plate, not by hand. Medium: lithograph (after the painting). 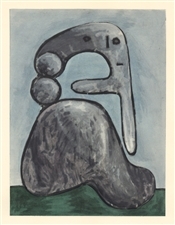 Printed in 1952 by Mourlot Freres on Arches paper and published in Paris by Louis Carre in an edition of 1000 for the rare "La Figure dans L'Oeuvre de Leger" exhibition catalogue. The total sheet size (including margins) is 10 3/4 x 7 1/2 inches (273 x 193 mm). There is printed text on the back side, as issued. Not signed. Medium: lithograph (after the painting). 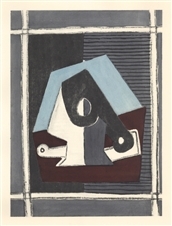 Printed in 1952 by Mourlot Freres on Arches paper and published in Paris by Louis Carre in an edition of 1000 for the rare "La Figure dans L'Oeuvre de Leger" exhibition catalogue. The total sheet size (including margins) is 10 3/4 x 7 1/2 inches (273 x 190 mm). There is printed text on the back side, as issued. Not signed.